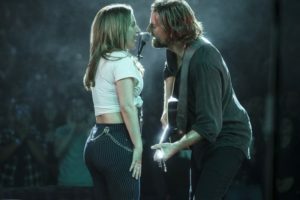 Undeniably, the new “A Star is Born” shines due to the realistic chemistry between Bradley Cooper (Jackson Maine) and Lady Gaga (Ally). Cooper’s directorial debut is a winner, in that the script’s development provides the background of the characters that is sorely missing from the 1976 predecessor of the same name. Following the rising star/falling star story original 1937 version starring Fredric March and Janet Gaynor, and the sequential remakes, 1954 starring James Mason and Judy Garland, and 1976 starring Kris Kristofferson and Barbra Streisand. The 2018 film as a whole is nothing short of a masterpiece, providing raw Oscar-worthy performances alongside a winning musical score. Here, a star, Lady Gaga, has truly ‘been born’ in her electrifying acting film debut. Offering an even script with rich characters creates brilliant storytelling. 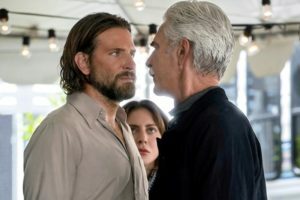 The addition of Maine’s brother played by Sam Elliot (Bobby Maine), provides insight and depth to Jackson’s spiraling addiction to drugs and alcohol; the crux of the story. Also, Dave Chappelle, Jackson’s friend (Noodles) and Andrew Dice Clay (Lorenzo) Ally’s father heighten the film as well. It’s a beautifully told romantic story of two people that love each other deeply; however, one can’t save the other from past family demons. It’s also the story of two people working together to enhance each other’s musical talents—sacrificing their careers for the advancement of the other—with love at its core. Opening with a remarkable backstage concert shot of Jackson’s band, we view a coke-snorting, shot-taking musician perform to an equally jacked up crowd. Cinematically, we see the band’s performance from their point of view; a technique that serves the film well, as we gain awareness of the frenzied crowd then contrasted with the silence of the lone ride afterward in a stretch limo. Jackson’s crave of a drink lands him in a gay drag bar where cross-dressers perform. He happens to catch Ally, a waitress performing on her nights off; he’s immediately impressed by her talent. Hand’s down; the best scene occurs when Jackson (sporting Sam Elliott’s Southern drawl, baritone voice), of which he worked with dialect coach, Tim Monich for several months to perfect, urges Ally to sing on stage with him. Again, our point of view of the stage is from Ally and Jackson’s point of view, when Ally finally reaches those high notes, causing the crowd to erupt in shrieks and applause, we are hooked. During the Chicago, Q&A Cooper said the voice idea came to him from reading Bruce Springsteen’s autobiography, in which he noted Bruce tried to sing like his dad. Bobby, Jackson’s older brother, served as his substitute dad after their father’s death; Cooper’s Sam Elliott voice is remarkable as the bond between the brothers is intensified. It’s also a great move due to the unique, recognizable tone of Sam Elliott’s voice. As in the previous films, as Ally’s star rises, Jackson’s star fades causing the demons to grow deeper, while the addictions increase. We are privy to emotional, transformative and passionate scenes by both actors. The music does take center stage with both Lady Gaga and Cooper singing original songs that are highly entertaining. You may shed a tear or two; however, the film is uplifting as personal growth, and rising talent opportunities are brought to the forefront. The Bottom-Line: One of the best films of 2018 so far. Cast: Bradley Cooper, Jackson Maine, Lady Gaga, Ally, Sam Elliott, Bobby Maine, Dave Chappelle, Noodles, Andrew Dice Clay, Lorenzo, Anthony Ramos, Ramon, Rafi Gavron, Rez, Luke Nelson and Promise of the Real, Jackson’s band.